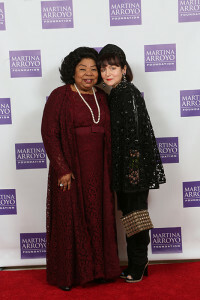 The Martina Arroyo Foundation on Monday, November 16th celebrated its 11th Anniversary of Prelude to Performance. The gala was held at the JW Marriott Essex House in New York City. This was a night to remember, when the worlds of music and fashion merged to form a special magic with an excitement of its own. 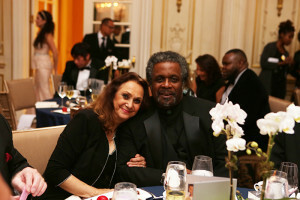 Brian Kellow, Features Editor of Opera News and bestselling author and radio WQXR evening’s host Terrance McKnight, lent their abundant charm as co-hosts and introduced many distinguished guests in the audience. Gala Producer Midge Woolsey led us in a brief moment of silence for the victims of Paris. The Michel Maurel Award was given to Ernst Rieser, longtime friend, adviser and personal assistant to Mme. Arroyo. Martina Arroyo looking resplendent in a burgundy gown presented the award named after her late much loved husband. Martina Arroyo also presented an award to honored guest,Artistic Director Ted Sperling of MasterVoices (formerly The Collegiate Chorale). He then conducted the chorale in a brief magical piece from Purcell’s Dido and Aeneas with angelic purity of tone. The operatic portion then began with “The Flower Duet” from Madama Butterfly by Giacomo Puccini. Brandie Sutton, soprano and Hyona Kim, mezzo blended their voices beautifully. Ms. Sutton is a soprano of radiant promise. Ms. Kim’s majestic mezzo mellowness was alluring. Akari Weintzen was an adorable “Trouble,”(Butterfly and Pinkerton’s child) and performed her tasks with deft professionalism. This was a poignant segment beautifully done. Their tossing of the blossoms to prepare for Pinkerton’s arrival melted the heart. Jennifer Rowley, sang “Pace, Pace, Mio Dio from Giuseppe Verdi’s La Forza del Destino. Ms. Rowleys opening note was held seemingly forever reaching fortissimo and then diminishing to a whisper. A true Verdi soprano, Ms. Rowley went from strength to strength as if combating the caprices of destiny with prayerful defiance. Her “Maledizione’s” were individually spine chilling. Jennifer Rowley made a successful Metropolitan Opera debut as Musetta last year. 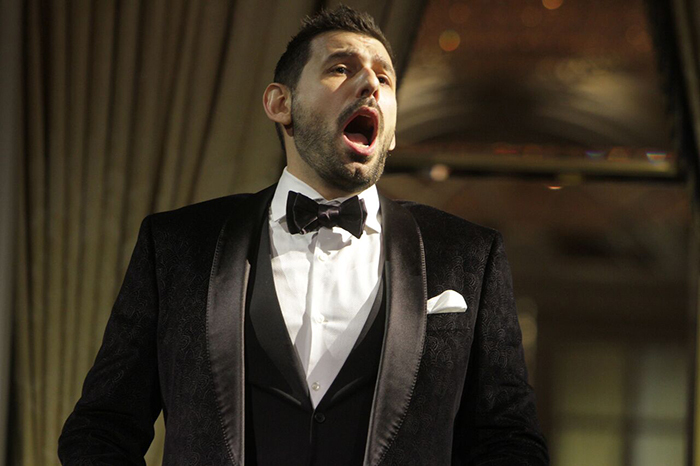 Dinner was served and the program continued with international rising tenor Michele Angelini, who was born in Brooklyn-why not? So were legendary tenor Richard Tucker and baritone Robert Merrill. Angelini thrilled us with a powerful interpretation of “Ah! mes amis” from Donizetti’s La Fille du regiment. The 9 high “C’s” were hammered out with insouciance, grit and charm. Brian Kellow then presented an award gift to Greek born Joanna Mastroianni whose fashion collections reflect her sense of style and elegance. A brief film was shown of her designs accompanied by the haunting voice of Maria Callas singing “Eben” from Catalani’s La Wally. An auction followed with a real auctioneer-Angelo K. H. Chan! 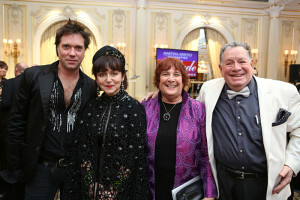 Some of the auction gifts were: a week in the Palais de Paris dans Le Marais, tenor Michele Angelini for an evening of singing, famed Italian Parisian chef Paolo Petrini for a private dinner for eight, and a “poker” night with Martina Arroyo, Marilyn Horne and Tyne Daly were among the highlights! The Act Two lesson scene from La Fille du Regiment was then performed. Claire Coolen used her saucy soprano and comedic timing and versatility with humor and elan. Karolina Pilou used her dark, plummy and pliable mezzo with great aplomb along with Michele Angelini’s exciting tenor and Jacopo Buora’s resonant bass baritone, put them in a pot and a brilliantly funny brew ensues! After coffee, tea and desserts and closing remarks from Brian Kellow and Terrance McKnight an “extra dessert” followed. Soprano Cecilia Violetta Lopez, who caused a sensation as Violetta in Prelude to Performance in 2014, sang the “Csardas” from Johann Strauss’ Die Fledermaus. Ms. Lopez‘s flourishes, scales and exciting coloratura took us on a roller coaster ride that ended with a sustained high note and brought down the house. It was a rousing finale from a young and gifted singer. The exceptional accompanists were Lloyd Arriola and Noby Ishida. Metropolitan Opera baritone Mark Rucker who coaches the awardees, and his wife Sadie (Publicity) have given their all since the conception of Prelude to Performance and deserve great kudos. Our table was graced by Gerda Lissner President Stephen De Maio with Board of Directors Michael Fornabaio, Karl Michaelis, Joyce Greenberg, also Gloria Gari from The Giulio Gari Foundation, Maestro Eve Queler, Robert Lombardo famed vocal agent, soprano Barbara Ann Testa vocal judge, Cavaliere Edward Jackson, and we greeted F. Paul Driscoll, Editor of Opera News, Sachi Liebergesell, President of the Licia Albanese–Puccini Foundation, Murray Rosenthal from Opera Index, Maestro Stephen Phebus and Linda Howes were also present. It was a pleasure to meet Rufus Wainwright (Benefit Committee) composer/musician who had a huge success at The Brooklyn Academy of Music (BAM) with his opera Prima Donna as well as fashion honoree, Joanna Mastroianni. Famed coloratura soprano Harolyn Blackwell was as perky and vital as when she sang an unforgettable “Oscar” in Verdi’s Ballo in Maschera with Luciano Pavarotti at The Metropolitan Opera. This was a night of good friends, good food, great singing and all the good and beautiful things in life. Thanks to Gala Chair Cecilia Teng, Gala Producer Midge Woolsey and co-chairs Donna and Richard Esteves and Andrew Martin-Weber. 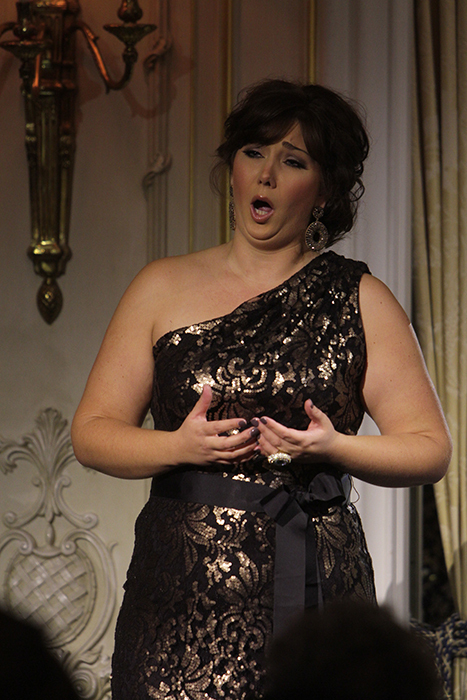 Soprano Jennifer Rawley. Photo by Jen Joyce Davis. Martina Arroyo, magnificent Metropolitan Opera and international soprano, human being and humanitarian fully deserved her recent honor at the Kennedy Center. Madame Arroyo’s work with young promising opera singers is through her Foundation in its Prelude to Performance at the Kaye Playhouse at Hunter College. This program prepares the winners with scholarships plus a stipend for six weeks of study and presents them in four fully costumed productions with orchestra. In July 2016, Prelude to Performance will present two performances each of Die Fledermaus by Johann Strauss and Puccini’s La Boheme. This also provides the true antidote for the evils in the world by letting the indelible imprint of enlightenment through music enter. Thanks to the Martina Arroyo Foundation, opera will continue to thrive as young singers are granted the opportunities to perform and offer their special gifts to the world.